A floral wreath has been laid on the grave of William MacGregor, Tamworth’s ‘champion of the poor,’ to mark the 130th anniversary of the Tamworth Co-operative Society which he founded. 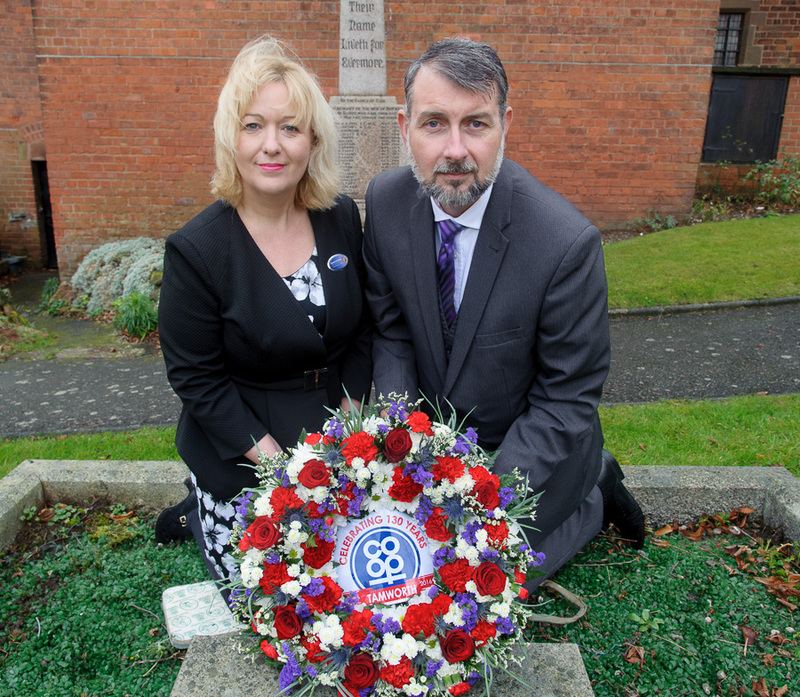 Amanda Woodward, general manager of Tamworth Co-operative Society’s funeral division, and deputy funeral manager Glen Speak lay a wreath on founder William MacGregor’s grave at St Chad’s Church, Hopwas to mark the 130th anniversary. The garland was placed at his burial place in St Chad’s Church, Hopwas, where he was a curate, by Amanda Woodward, general manager of the Society’s funeral division, and deputy funeral manager Glen Speak. Reverend MacGregor is widely regarded as the town’s greatest benefactor, bringing affordable food and other goods to the working classes through the co-operative movement. The wealthy Scot fought hard to improve living conditions for the under privileged. He took landlords to task over the squalid state of tenants’ homes, campaigned for clean water and proper sewerage for each household and rescued children from the workhouse by boarding them with families. Among his many acts of generosity was opening up his own home at Bolehall Manor to give orphans from the slums a much needed holiday. If all of that wasn’t enough, he personally financed Tamworth’s first hospital, created a free library, set up a working men’s club, and built churches in Hopwas and Glascote. St Editha’s, where he served as vicar, also benefited from his benevolence. He renovated the 14th century church and had its bells re-cast. He improved recreational facilities too, allowing part of his land to be turned into a park where youngsters could play in safety, and started a club for young men from all backgrounds. Rev MacGregor paid for a large building, complete with a swimming pool in Church Street, where the members of St George’s Club could debate issues of the day, receive lectures and enjoy sport. But it was the fiery clergyman’s determination to provide quality goods at fair prices for the ordinary people of the town that turned him into a controversial figure. His support for the establishment of a co-operative in Tamworth put him at loggerheads with rich shopkeepers who were making exorbitant profits on basic products such as meat, causing outrage in the general population. He was abused in the street and received vitriolic letters, but despite this pressed on with the foundation of the Tamworth Co-operative Society which began operating on December 10, 1886. He provided a base for the business in Church Street and crucially acted as its guarantor. Tamworth Co-op chief executive Julian Coles said: “His philanthropic spirit lives on with us. We still contribute greatly to our local community and we have remained an independent, local co-operative, committed to providing high quality, fairly priced goods.